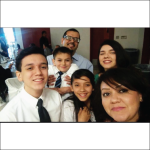 Victor Avila is a missionary in Algodones, Baja California, Mexico serving at Calvary Chapel Algodones. He was born in Orange, California in 1978 and was raised in a Christian home. Victor has been walking with the Lord and serving in the church, doing God’s general will for his life. He has served in various ministries since he reconciled with God in March of 2013. He has translated sermons, taught Sunday school, the Junior High Youth, men’s bible study and midweek services. Calvary Chapel Algodones is a church in Algodones, Baja California a small border town in northern Mexico known for its medical offices, pharmacies and bars. There is a great need in Algodones for the Word of God to be taught in a practical sense so that the people can learn how to apply it to their day to day life. Children are a large part of the attendees, so there is a great opportunity to teach them the Bible and show them the love of Christ while they are still young. Victor with the help of his wife, are involved in every aspect of the church, from teaching and counseling to maintenance and cleaning. Anything that the congregants and visitors need, with the help of God, they will provide.